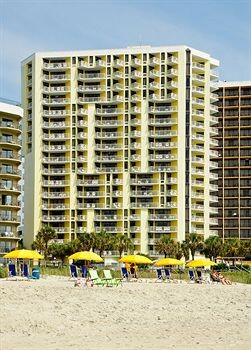 Property Location With a stay at Breakers Boutique North Tower in Myrtle Beach, you&apos;ll be on the beach and minutes from The Children&apos;s Museum of South Carolina and close to Broadway at the Beach. This beach condo is within close proximity of Captain Hook&apos;s Adventure Golf and Chapin Memorial Park.Rooms Make yourself at home in one of the air-conditioned rooms featuring DVD players. Rooms have private balconies. Complimentary wireless Internet access keeps you connected, and cable programming is available for your entertainment. Conveniences include coffee/tea makers and blackout drapes/curtains, as well as phones with free local calls.Rec, Spa, Premium Amenities Don’t miss out on the many recreational opportunities, including a spa tub, a sauna, and a fitness center.Dining Satisfy your appetite at a coffee shop/café serving guests of Breakers Boutique North Tower. Relax with your favorite drink at a bar/lounge or a poolside bar.Business, Other Amenities Featured amenities include express check-in, express check-out, and a 24-hour front desk.